Chromatography works by separating the individual parts of a mixture so that each one can be analyzed and identified. In the decades since its invention, the chromatograph has become an essential piece of equipment in bio-chemical laboratories. Using the analytical technique of chromatography, scientists can tell what chemical compounds are present in complex mixtures. These mixtures include such diverse things as smog, cigarette smoke, petroleum products, or even coffee aroma. Without chromatography, chemists might not have been able to synthesize proteins such as insulin or understand how plants use the sun's energy to make food. The first chromatograph was invented by Russian botanist Mikhail Semenovich Tsvett (1872-1919). While working in Poland, Tsvett was looking for a method of separating a mixture of plant pigments (tints) which are chemically very similar to each other. To isolate different types of chlorophyll, he trickled a mixture of dissolved pigments through a glass tube packed with calcium carbonate powder. As the solution washed downward, each pigment stuck to the powder with a different degree of strength, creating a series of colored bands. Each band of color represented a different substance. Tsvett referred to the colored bands as a chromatogram. He also suggested that the technique (now called adsorption chromatography) could be used to separate colorless substances. Although Tsvett published a report of his work in the early 1900s, chemists paid very little attention to it. There were a few reasons for ignoring the work. First, the report was written in Russian, which few Western chemists of the time read. Second, the technique may have seemed too simple to chemists who were used to relying on lengthy extraction, crystallization, or distillation processes to separate mixtures. Within a few years, Tsvett's technique was rediscovered. The rediscovery was by the German organic chemist Richard Martin Willstatter (1872-1942), who was also studying chlorophyll. By introducing chromatography to Western European scientists, Willstatter helped establish one of the most versatile analytical techniques known to chemistry. processes. During World War II (1939-1945), life rafts were equipped with survival kits that contained resins for removing most salts from seawater. The most dramatic advance in the history of chromatography took place in 1944. It was then that scientists discovered that a strip of porous (full of small holes) filter paper could substitute for the column of absorbing powder. The technique was called paper chromatography. A drop of the mixture to be separated is placed on the paper, then one edge is dipped into a solvent (a substance that dissolves). The solvent spreads across the paper, carrying the mixture's components with it. When the components are finished spreading, the paper is dried and sprayed with a reagent that reveals a change in color. Because the components move at different speeds, they show up as distinct, physically separated spots that can be cut out with scissors and further analyzed. The paper method is a type of partition chromatography, which is based on differences in solubility (the measured rate at which one substance will dissolve in another) rather than differences in adsorption. One of its advantages is that it requires only a small sample of material. Paper chromatography was invented by two British biochemists, Archer John Porter Martin (1910-) and Richard Laurence Millington Synge (1914-). In 1941 Martin and Synge began working together on proteins, which are made up of chains of amino acids. The duo was trying to characterize a particular protein by determining the precise numbers of each amino acid present. Amino acids are so similar to each other, however, that the problem of separating them had defeated a whole generation of biochemists. Martin and Synge's development of paper chromatography to solve this problem was an instant success. It worked not only on amino acids but also on various other mixtures. The two scientists were awarded the 1952 Nobel Prize in chemistry for their work. Martin and Synge's research led to a number of other important scientific advances. After Synge determined the structure of an antibiotic peptide called "Gramicidin-S," Frederick Sanger (1918-) used paper chromatography to figure out the structure of the insulin molecule. He determined the number of amino acids in it as well as the order in which they occurred. Insulin is now used to control blood sugar levels in people afflicted with diabetes. The same technique was used by Melvin Calvin (1911-) during the 1950s. Calvin discovered the complex series of reactions that enable green plants to convert solar energy into the chemical energy stored in food. Working with green algal (algae) cells, Calvin interrupted the photosynthetic process (process by which plants that contain chlorophyll use light to change carbon dioxide and water to carbohydrates) at different stages by plunging the cells into alcohol. Then he crushed them and separated their components via paper chromatography. Calvin was thus able to identify at least ten different intermediate products that had been created within a few seconds. 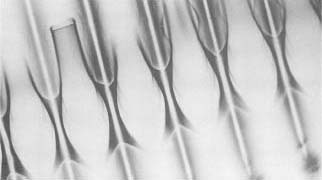 Paper chromatography was also used by Austrian-American biochemist Erwin Chargaff (1905-), who modified the technique to study the components of the nucleic acid molecule. His research revealed four components, or nitrogenous bases, that occur in pairs. British biochemists James Dewey Watson and Francis Harry Compton Crick later used these results to work out the structure of DNA (deoxyribonucleic acid). In addition to inventing paper chromatography, Martin developed another technique called gas chromatography. The process allows chemists to separate mixtures of gases, or substances that can be vaporized or gasified by heat. Instead of a liquid solvent, helium gas is usually used to force the mixture through a column and separate the gaseous components. Martin and his colleague A. T. James first used gas chromatography to micro-analyze fatty acids. The widespread acceptance of gas chromatography is unique in the laboratory instrumentation field. Today it is used in almost every branch of the chemical industry, particularly in the production of petrochemicals from oil and natural gas. One of the most common fixtures in biochemical laboratories is "GCMS" (gas chromatography, mass spectrometry) analytical equipment. This equipment uses gas chromatography to separate individual components from complex organic mixtures, then uses mass spectrometry to identify each component. Recently, chromatography has evolved into even more sophisticated analytical techniques. In thin-layer chromatography, for example, an alumina gel, silica gel, or other finely divided solid is spread onto a glass plate in a thin, uniform layer. This takes the place of filter paper in the chromatographic process. The technique is not only faster than paper chromatography, but it can also separate smaller quantities of pure components. It is often used in the pharmaceutical industry to isolate penicillin and other antibiotics. Thanks for all the help. Your website helped me alot on my research paper! Perfect! Just exactly what I needed for my science fair project! 1 webite is all i needed thanks to you guys! It will be very usefull for my Practicals. The above article is very nice.Compare to all orther chromatography articles. thank you....for providing appropriate knowledge. this help me lot in making the project. Yay! You guys were the only site I needed 4 my science project! I'll try to remember this site for high school! Wow, VERY helpful. You're the only person that explained how liquid chrom. was first done. This article was very useful to learn about chromatography! Thank you! I also found that chromatography can be used to detect drugs, such as in someone's blood. This is a very helpful article! Very helpful... BUT... can we add the year chromatography was invented by Tsvett. Wow, this really helped with my research on chromatography. Very professional. Thank you so much! My home work will now be so much better!! This article helped me find research on paper chromatography and its uses for a science paper. I will definatley be coming back to medical discoveriess in the future! This website helps my research on Chromatography. Thank you. Thank you so much! This really helped a lot for my homework. Thx sooo much for the help. It really helped me finish the research project that i had to do! This Website helped me a whole lot with my science assignment! I'm going to tell everyone about it! Thanks!!! Can you determine Vitamin C contents with a chromatographer? Thanks for this info very much! phew! i searched many references but not as satisfactory as this one! and once again thank you very much! This helped me a lot with my science paper on Foresic science. Thanks! Who is the author. I need it to be able to cite this. Thank you. This was a great help for my science assignment. It help me a lot! thanks for who created this website! you help some people in need! thanx very much!!! u raelly helped me with my chemistry assignment. thnk u for the infor in your website...it help me in my biochemistry lab. Thanks...this has helped me a lot in my assignments..
what are the interesting facts of paper chromatography? This helped me on my Science Fair project. Thanks!!! This helped me a lot for a research project. I really appreciate the help. Thank you for making this article, I am doing my science fair about chromatography and it helped me a lot on my research and background! My name is Aly and I would like to know if you would have any interest to have your website here at discoveriesinmedicine.com promoted as a resource on our blog alychidesign.com ?